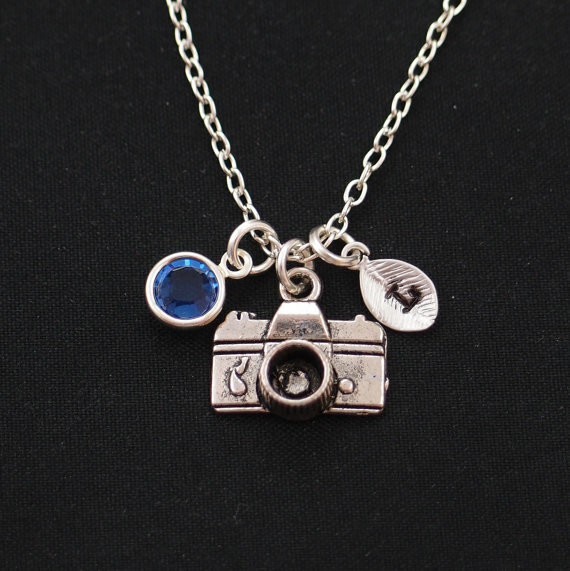 If you’re looking for photographer gifts, jewelry is always a good option! 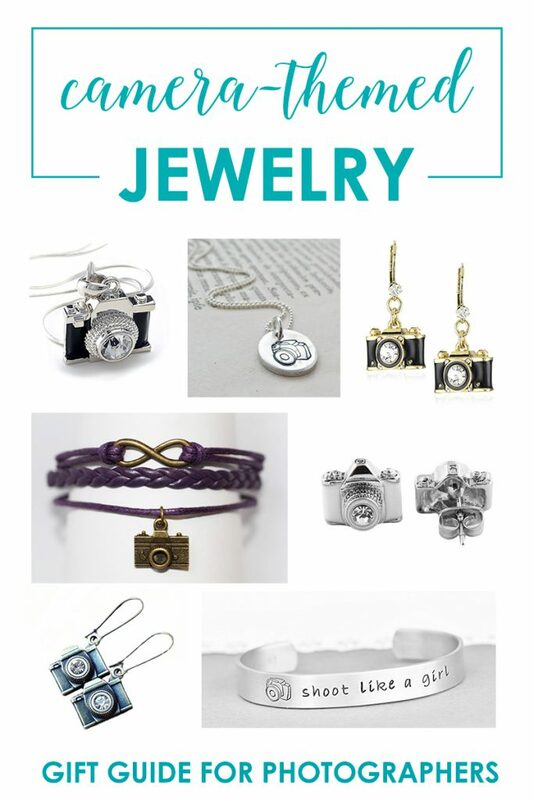 From classic and minimal to trendy or bohemian, there are plenty of options for camera-themed necklaces, earrings, and bracelets available! 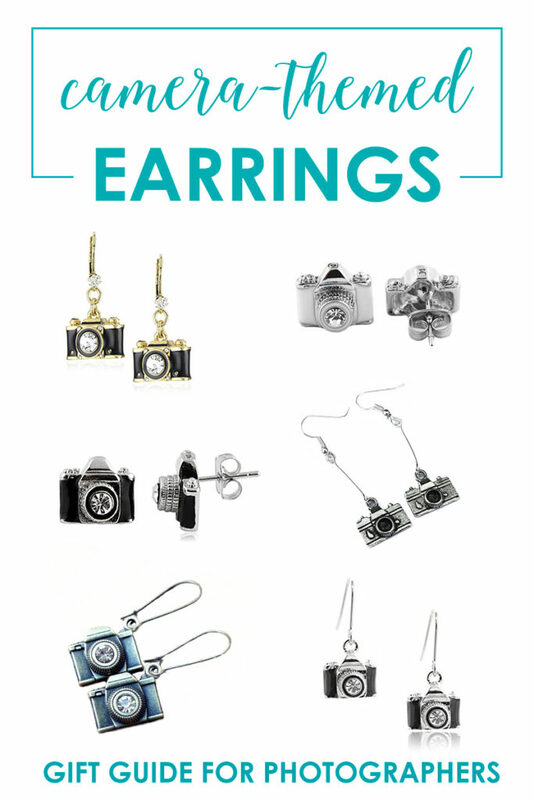 You’re sure to find jewelry to fit any photographer. I gathered together my favorite items from several different categories, and I purposely included items from different styles and price points. Feel free to browse and I’m sure something will catch your eye! I LOVE necklaces! 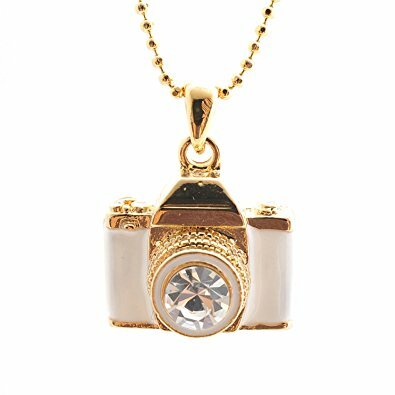 A pretty camera on a chain is just such a good gift – there are lots of different styles and designs, but they all speak of our love for having a camera around our neck, even when we aren’t officially shooting! 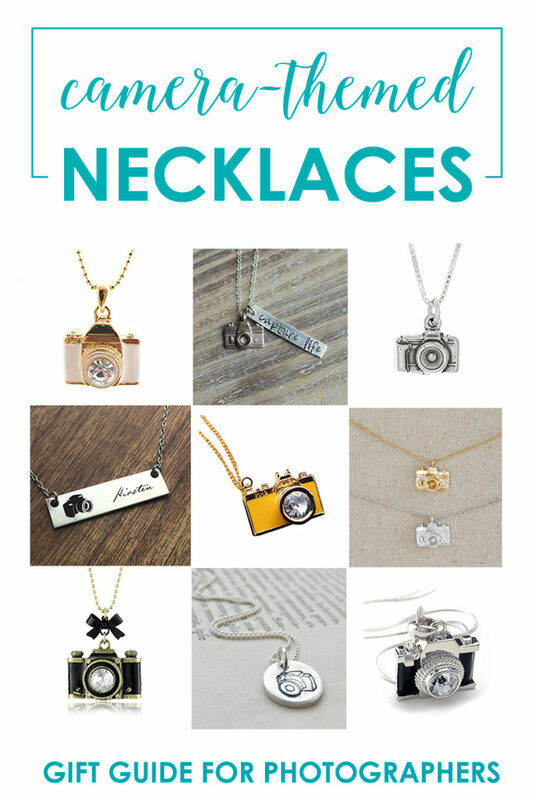 Check out these necklaces below to find just the right one! 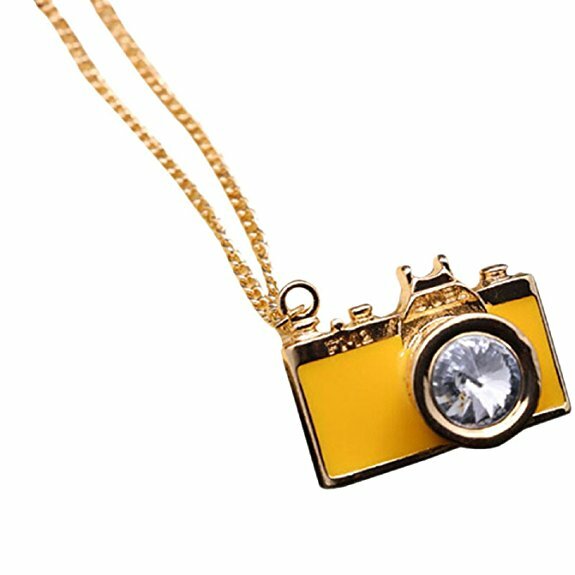 This is a classic, good looking camera necklace. The little bit of bling is a nice addition. This is a simple but beautiful necklace. 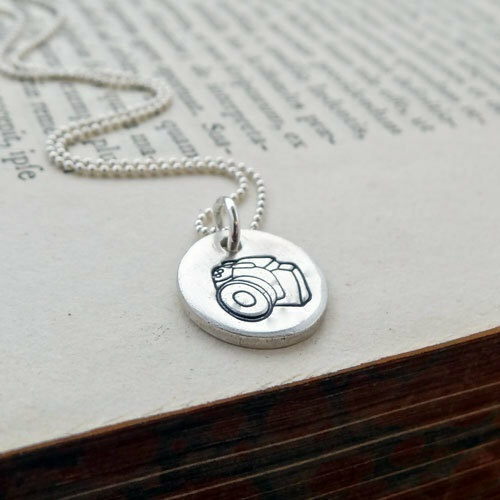 This round disc is a great alternative to the camera charms and the stamped look is unique. 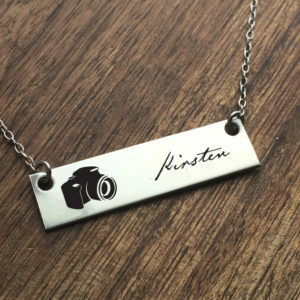 This one would be the perfect high-quality gift for a photographer friend. It’s gorgeous, and even has a black bow! This white one is unique and so pretty – I think it’s my favorite on this list. This necklace comes in brass gold, stainless steel, or copper. It has a camera image and the ability to personalize it with a name! 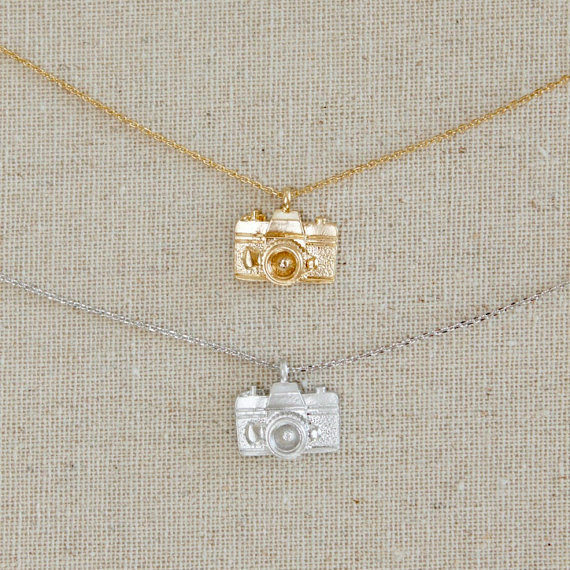 The charm on this camera is dainty and tiny – but you can also choose which size chain you want to get with it, from 16-30” long. 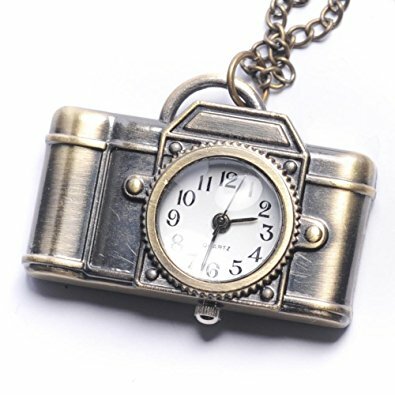 This is a pretty necklace. If you like minimal, classy jewelry, this one is simple and comes in gold or silver! This one is cheap but surprisingly good quality. It comes in other colors like pink, blue, and teal. It takes a long time to come in the mail though, so plan ahead! Oh, and this mustard color is called “orange” in the listing. The “yellow” option is more of a pastel lemon shade! These necklaces offer a little different color options in these small charms. I think the antique bronze coloring is fun and different too! 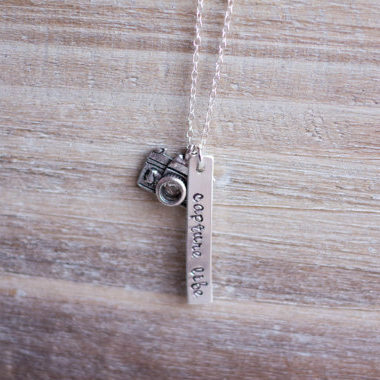 You can personalize this necklace by adding your photographer’s birthstone and initial. 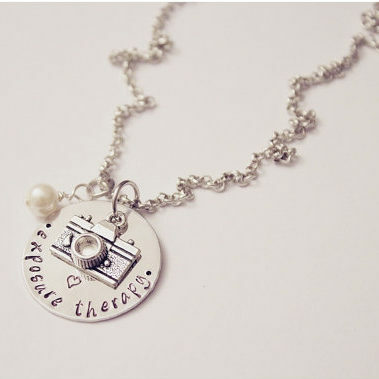 It just adds a little personal touch that other necklaces lack. 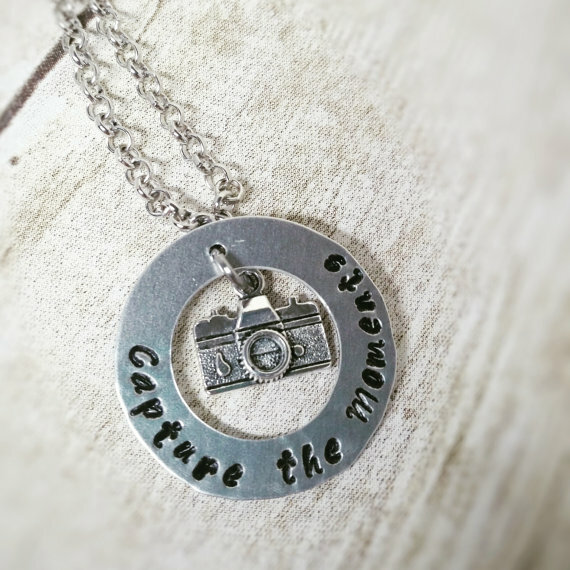 This necklace has the perfect sentiment for photographers, especially mom photographers. Photography is about “Capturing the Moments” in life. This one has a clock inside the lens! Find it here on Prime, or find it here for cheaper with slower shipping. 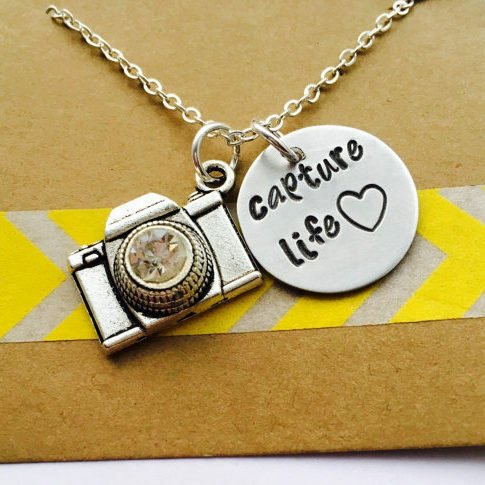 Similar to the necklace above this has the camera charm but adds the saying of “Capture Life” on the disc instead of a bar above. 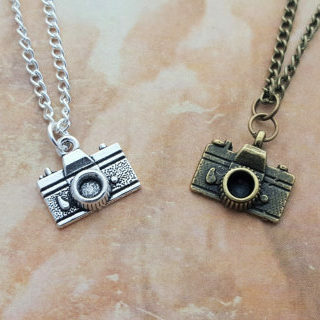 I chose a lot of necklaces that might look similar but every photographer has their own style. Some people like charms, some like words with a saying. 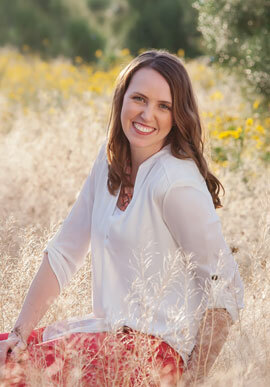 Make sure to pick the perfect one for your photographer friend! I love these ones! High quality with a little bling! 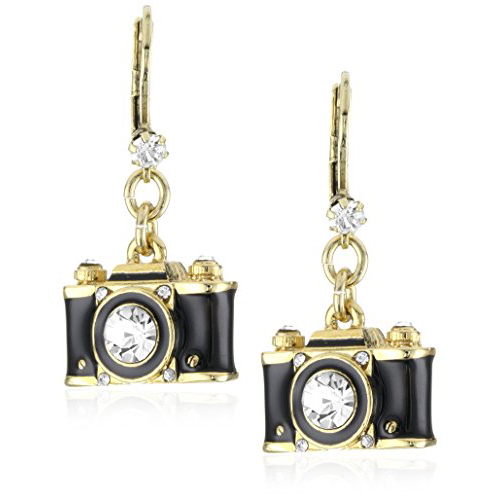 These are similar to the earrings above, with a little less bling and in silver. How pretty! Love the shiny rhinestone in the lens. These are silver-on silver earrings, which is a very classy look! 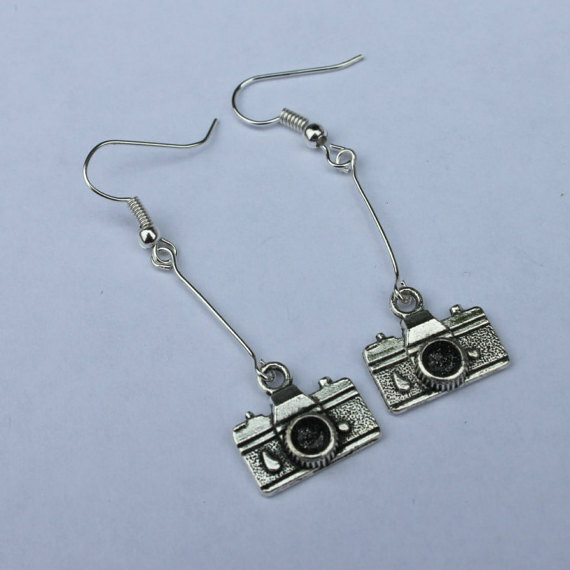 These earrings are great for those photographers who love dramatic earrings. The extra length is great for drama. If you like vintage style these are perfect! You can even choose which type of wire you want them on. 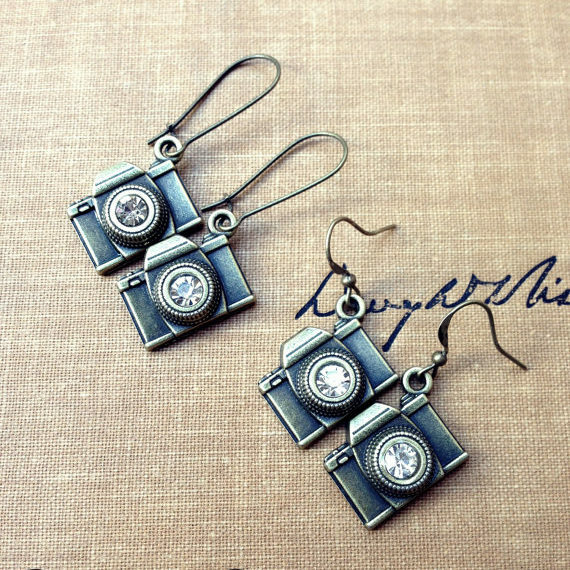 This way you can get the perfect earrings for you or the photographer in your life. These are super unique – they are soft, silicone, that stretches slightly, meant to look like the ring on your lens that zooms! They double as a tool to help stop your lens from zooming or “creeping” when you don’t want it to. I love that this one is handmade! And shooting like a girl is a compliment! 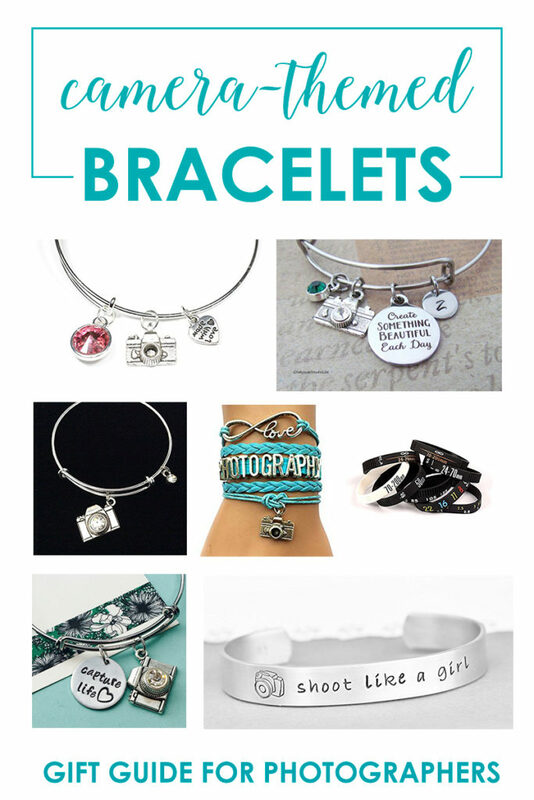 This unique stack of bracelets has turquoise or brown leather straps and a few photography-themed charms. Very unique and bohemian looking! 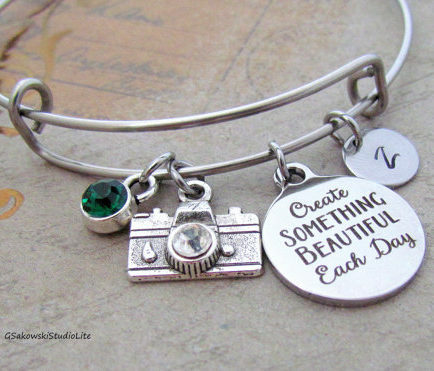 This is a like an Alex & Ani wire bangle, but handmade! This unique bracelet has three layers of leather. 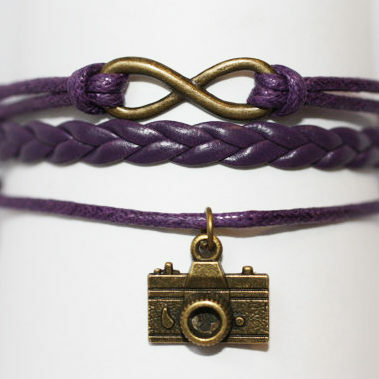 The purple is super classy with the bronze camera charm! 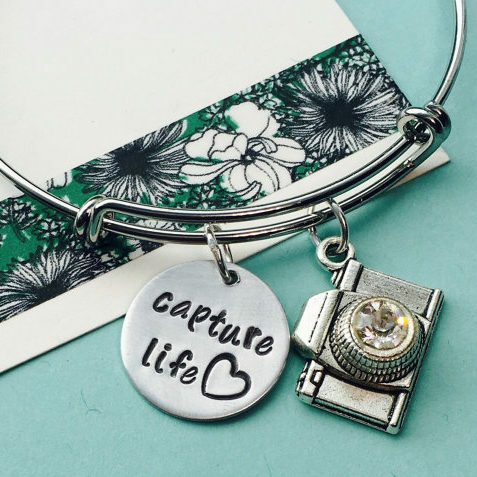 This bracelet is similar to the Alex & Ani bangles – with a camera charm and a birthstone gem! 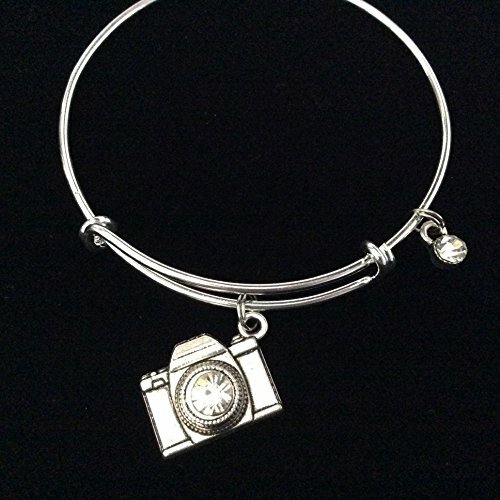 Another pretty charm bracelet on an Ani & Alex type bangle. 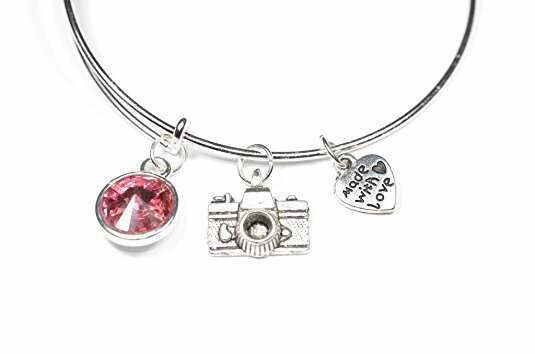 This bracelet is so easy to personalize – add a letter and a birthstone charm to the camera and “create something beautiful each day” charm. A very thoughtful gift! So many cute options! 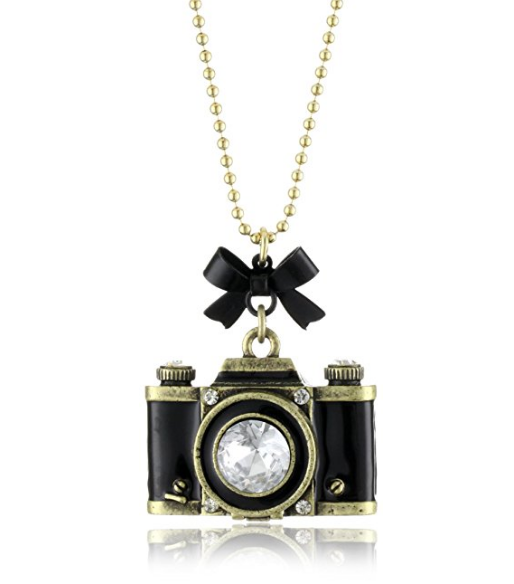 I love all of this camera-themed jewelry – there are a options for every type of photographer, style, and price point. Did any of this jewelry catch your eye? Anything you want to put on your own wishlist?